The other day, my US colleague was teasing me that he got to drive the Audi A8L in US and he has written a review about it to which my answer was that even I got to test drive one here in India. Now, today, later on, I can email him saying that we actually got to compare the stalwarts in this segment and even proclaim a winner of the battle royale. The 2011 Audi A8L launched just a few days back is all set to challenge the Mercedes S class and the BMW 7 series for the throne of the ultimate luxury car here in India. 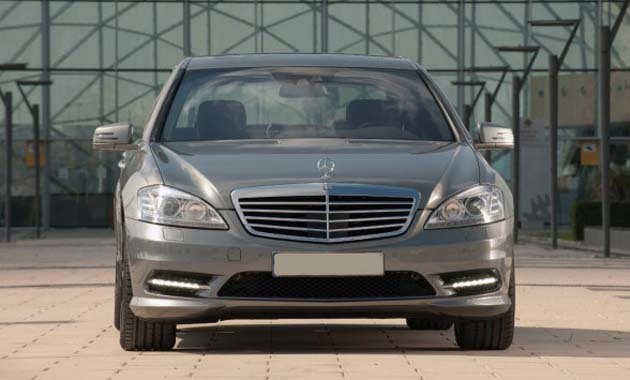 The Mercedes S class ruled the roost for long with the BMW 7 series taking over the mantle a few years ago. It is now upto Audi to challenge the reigning king of the throne, the BMW 7 series and the omnipresent Mercedes S class. So basically, we have pitted all base petrol motors here since most of the buyers in this category, since they have the money, wouldn’t choose diesel motors. The stats say this. Without any further ado, here is the comparison between the three warring Germans. BMW 740Li : The BMW 7 series is the 5th generation model that we have in India here. Changed than its previous generation controversial version, the BMW 7 series does pack a punch and in its long wheelbase version, it is all the more distinguishable than other BMWs. The BMW 740Li in India sits a tad lower than its competition.I must say that it has got the most tastefully done alloy wheels in this comparison. Those corona head lamps make it look distinct. Two miniscule fog lamps adorn the air dam. The typical Hofmeister kink along with the twin tail pipes housed in the lower bumper section does cut a distinct figure here. Audi A8L 4.2 FSI : The newest kid on the block, the Audi A8L 4.2 FSI in India doesn’t look far different than its predecessor. The full setup of LED lamps with that traditional Audi grille does make the Audi A8L look very butch. It has got no fog lamps and moreover the rear profile shows nothing distinguishable than the other Audis. It has got the twin tail pipes which are actually different from the rectangular ones found in its competition. Mercedes S350L : The Mercedes S-class has been around since ages. To be exact, from 2005. It has moved on mostly unchanged except for a few changes. Indians still do revere the 3 pointed star on the hood and the Merc has got LEDs as part of its fog lamps whereas the head lamps are powerful Xenon units. Out of the three cars here, the Merc looks the most stately from the front. Like the BMW, it has also got twin tail pipes and ones which are rectangular in shape. Tough one, this is. However I would give it to the BMW 740Li for been the most distinguishable of this lot. BMW 740Li : The BMW 740Li in India boasts of having one of the simplest multimedia interfaces amongst the three. I can just wonder how roles have been reversed. Few years back, all I could hear or read was how un-intuitive the Idrive system was but now it has changed. The overall cabin design looks very simple and especially so for a flagship car. It has got wooden inserts in the steering wheel and uses more wood in the cabin than the others here. Keeping in mind, its driver focused interiors, the front seats are one of those firm gripping ones. They are almost arm chair like and one gets that typical BMW feel everywhere. The rear seat which is the most likely place for the owners of the BMW 7 series, is a bit low but then first class comfort is what you can expect here. No dearth of space either as this is the long wheelbase version. There are many gizmos to play around with as well. Massagers are available as an option for the rear seats. Boot space is something in which I wouldn’t delve into since it is not expected that 7 series owners would hardly carry any luggage. Instead, they would have their own separate Innovas to carry the luggage part. 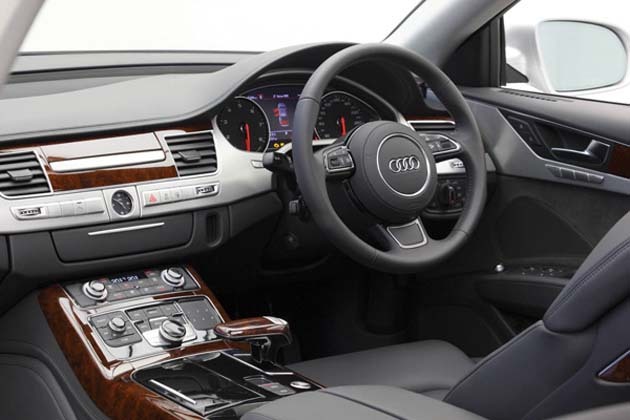 Audi A8L 4.2 FSI : What a stark change from the old Audi A8, the new one boasts of a headsup display system in the central console and is one of the brilliant cabins that Audi has ever built. The front seats however aren’t too supportive like the ones in the BMW. Individually they are good but in company of the BMW, they don’t shine as much. Giving a genuine look is the wood trim around the central console. The MMI interface now integrates a handwriting gesture recognition feature.The dashboard however looks cluttered with the plethora of buttons. The beautiful part is the rear seats with their Executive Seating arrangement. The space is enormous and every command of yours is obeyed with the single press of a button. Take for example the way, the front seat slides ahead revealing a little foot stool and a table popping out of the rear center console to accommodate your laptop or important papers. Pampered luxury, I would say. Everything has an attention to detail which the BMW cannot match nor can the Mercedes. Mercedes S350L : The Mercedes S350L in India has that same muddy upholstery color which one expects from all the Mercedes cars. The interior design theme looks a bit boring and dated now. The half wood, half leather steering wheel also doesn’t feel too good to grip. The COMAND system used by Mercedes for controlling the various functions of the car is limited in its applications as compared to the other two Germans in this comparo. But come to the seating arrangement and the Merc gives a tough fight to the others here. It was the first car to have the massaging seats concept and the others have simply picked it up and moved on. Everything has a soft feel to it and the head rests make for one helluva touch of luxury. Cut to the rear seats and the all black interiors make it feel less spacious than it is. It for sure, cannot match the backseat leg room that the others can offer here. I will hand it over to the Audi A8L for having the most comfortable backseat as well as nicely put interiors. One more thing is that though all the cars feel well built, it is the Merc which stands out with its solid feel. BMW 740Li : The BMW 740Li in India uses the independent multi arm axle with anti dive in the front whereas the rear section uses independent anti dive , anti squat construction for the suspension. True to its driver’s car tag, this one is a bit stiffly setup than the others here. It has different modes like Comfort, Normal, Sports and Sports+ to aid it in giving the best possible ride and handling package. Slot it in Comfort mode and the car delivers the best ride possible. Sure, the suspension does let you know what it is exactly doing and isn’t as refined as one would like an executive saloon to be. The handling is the best part and to really experience it, one has to slot the suspension mode to Sports+. The suspension tauts itself and steering responses become more linear. However the older steering feel is now gone and the steering now feels slightly vague. BMW has actually lowered its goal post now. But still belying its size, the BMW 7 series just obeys commands like a hatchback. Audi A8L 4.2 FSI : The Audi A8L 4.2 FSI in India gets an anti roll bar, multi link front suspension with double wishbones whereas an anti roll bar with trapezoidal wishbones does duties at the rear. The A8L just swallows every bump that you throw at it but some of its war with the road does spill over inside the cabin. The very sharp bumps sometimes catch it off guard. Like the BMW, it also gets the Dynamic and Comfort modes. The steering does place the car exactly where one wants it to be but then go fast and it disconcertingly becomes a bit numb. It is totally devoid of feel and more like the Audi A8L asking you to go slow. NVH is nicely damped but still some slight road noise does filter inside the cabin. Mercedes S350L : The Mercedes S350L in India gets Airmatic front suspension with four link gas shock absorbers whereas the rear end boasts of multi link with anti dive anti squat construction. The Mercedes just glides over everything in its path. The air suspension does provide for a good pliant ride quality which the others cannot emulate in this comparison. However the low NVH levels for which the Merc was earlier known for, has been overthrown by the Audi A8L. The motor in the Merc becomes raucous when it nears its redline. The steering surpasses the BMW’s in terms of feel and feedback. But then the handling isn’t up to the mark and the softly sprung Merc does roll around quite a bit when forced into a corner. It actually is very boring to drive the Mercedes S-class. The BMW 7 series for sure on this one. BMW 740Li : The BMW 740Li in India gets a 3 liter straight 6 petrol motor with twin turbos and developing 326 Bhp of peak power with 45.88 kgm of torque coming in between 1500-4500 rpm. The transmission used is a 6 speed auto. For the record, the 0-100 kmph run ends in 6.60 seconds whereas the top speed is an electronically limited 250 kmph. This engine loves to be revved and seems unstressed even when it has neared its 7000 rpm redline. But then your chauffer would be doing some hard work since this engine lacks the lower down poke. Braking feel is very good and brake assist, EBD, CBC, ABS with traction control ensure that things remain sane even when the going gets tough. For the safety conscious, the BMW 7 series offers 6 air bags, night vision camera, 3 point ELR with pretensioners, lane change warning and many others. Fuel efficiency is 6.6 kmpl in city and 11.2 kmpl on the highway. Audi A8L 4.2 FSI : The Audi A8L 4.2 FSI has a 4.2 liter V8 engine which makes 372 Bhp of peak power at 6800 rpm whereas its peak torque of 45.37 kgm comes in at 3500 rpm. It is assisted by an 8 speed auto transmission. It expectedly crosses the 0-100 kmph barrier in only 6.4 seconds and its top speed is electronically restricted to 250 kmph. The ZF 8 speed auto feels as effortless as it can be. The engine is highly tractable and can even do overtaking maneuvers on the highway without even breaking into a sweat. All around discs coupled with ESP, ABS and Electronic Differential Lock (EDL). Safety is handled by the crash detecting Pre Sense system which prims the car before a car occurs, 8 air bags, side intrusion beams and the collapsible steering column. As far as fuel efficiency goes, it is 8.4 kmpl in city and 12.3 kmpl on the highway. Mercedes S350L : The Mercedes S350L in India has got a 3.5 liter V6 motor which makes 272 Bhp of power and 35.69 kgm of torque. It is aligned with a 7 speed auto transmission. The car completes the 0-100 kmph run in a lazy (in this comparison) 8.8 seconds whereas it has got the same electronically limited top speed of 250 kmph. The auto transmission is very slow to respond and it would be best in the hands of the chauffer who would have to battle it out in traffic or the highway. Brakes are a bit mushy in their application but do the job well of stopping the car well within the limits. The braking aids like ESP, ABS, traction control and active braking are also present. The Merc gets 6 air bags, PreSafe technology, night vision camera, rear view camera, driver alert system and many more safety aids. As far as fuel efficiency is considered, the Merc returns 6.7 kmpl for the city and 9.4 kmpl on the highway. The Audi A8L wins this round. 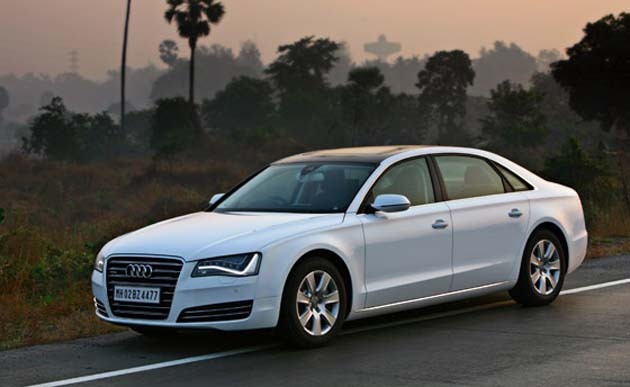 Based on the above analysis, it is the new 2011 Audi A8L in India which wins this round. However it isn’t without its faults. It has got an underwhelming driving experience and should you be the one who likes to occasionally take the wheel, then you would be disappointed. However when you are in the rear seat, it would pamper you like no other car in this category can. If you are looking for driving pleasure, then have your cheque books ready for the BMW 740Li in India. It has got the most distinct identity amongst all the cars here and more or less offers everything which the Audi A8L can provide for. It however skimps on some essential equipments, something which the Audi offers as standard. The Mercedes is the dark horse of the lot and it remains the same without springing any surprises during the test. It is by far, the most solidly built car amongst this trio. But then the interiors and also the exteriors are no patch for the others in this competition. Moreover, its engine and transmission options seriously need a revamp. The Audi A8L 4.2 FSI price in India starts at Rs 89 lakhs whereas the BMW 740Li price in India starts at Rs 85.40 lakhs. The Mercedes S350L price in India stats at Rs 85.14 lakhs. All these prices are ex-show room, Mumbai.